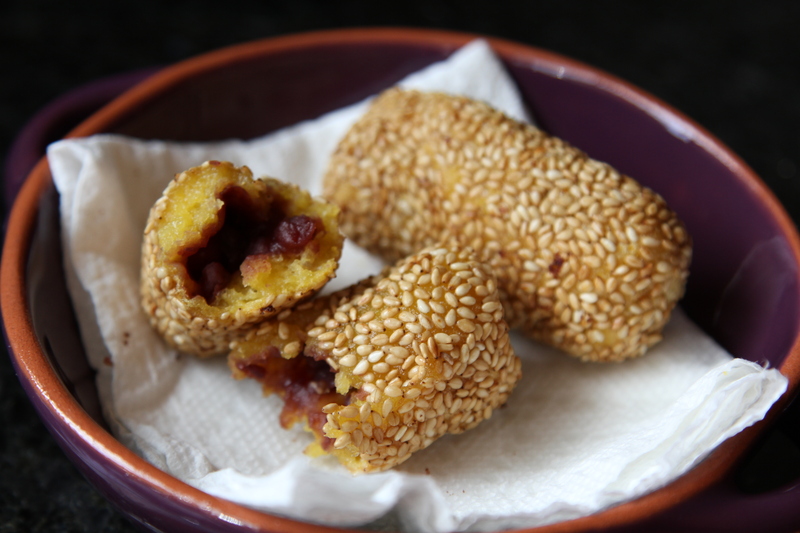 Fried Pumpkin Mochi Stuffed With Azuki Paste [recipe] – Cin Cin, Let's Eat! We have a sugar pumpkin that’s been sitting around the house since December. For some odd reason, I didn’t once crave for pumpkin pies this winter, didn’t even make one for Thanksgiving last year. I came across a recipe for pumpkin ricotta gnocchi the other day that motivated me to finally do something with the sugar pumpkin. I removed the skin, cut it up in big chunks, steamed it, and then puree it. Steaming squash is much easier and takes up less time than roasting, but the resulting puree will contain a lot more liquid. After making a big batch of the gnocchis (I’ll post the recipe and pictures soon), I still have about two cups of puree left. 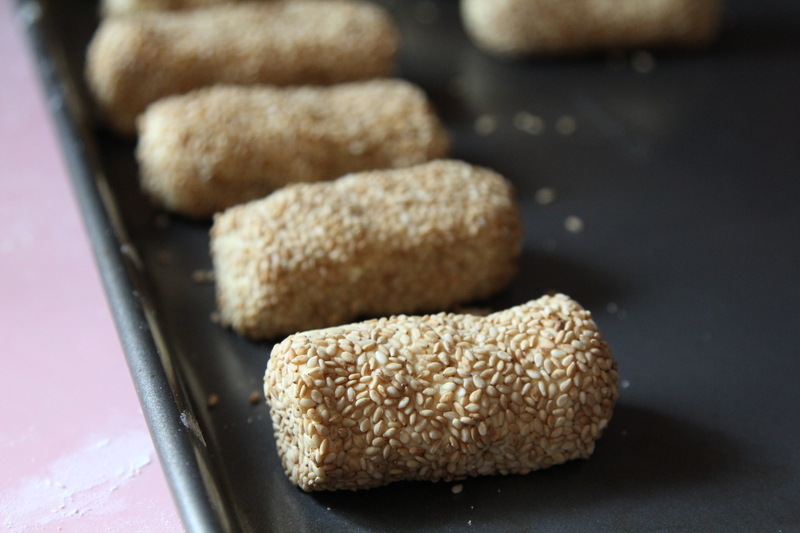 Keeping up with the lunar new year’s celebration, I tried my hand at making one of my childhood’s favorite dessert – fried sesame mochi balls stuffed with azuki (red) bean paste. My mom used to make it with sweet potatoes, but I thought pumpkin was an appropriate substitute. Due to the excessive moisture in the puree, I had to add extra glutinous rice flour, resulting in a slightly tougher mochi texture, but nevertheless, not a bad first attempt at making this delicious treat! Combine pumpkin, flour, and sugar together. 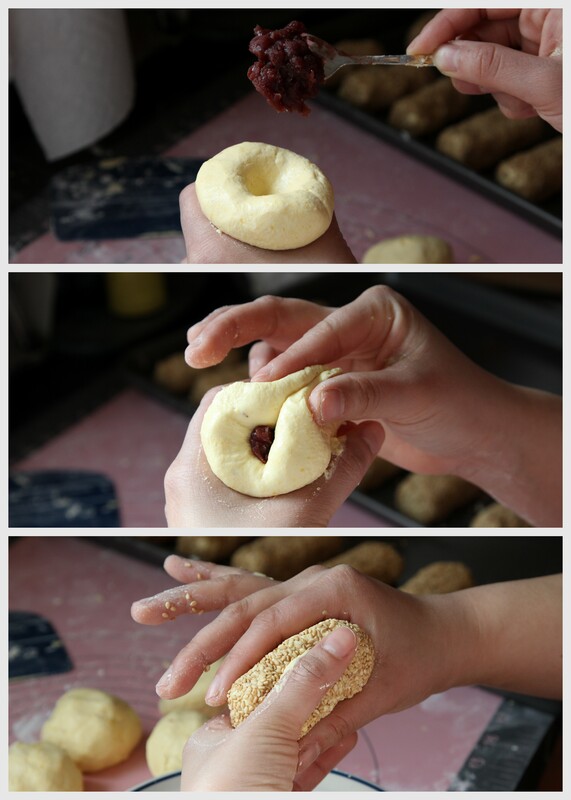 Roll and knead until it becomes a dough form and not sticking to hand. Add extra rice flour if the dough is too sticky. If the dough is too dry then add a teaspoon of water at a time. Divide the dough in quarters. Roll out each quarter into a 1″ thick log, then divide each log into 8 equal pieces and roll each piece into a ball. Don’t try to make each piece too big or it’ll take a long time to fry. Make a well in the ball of dough, place the bean paste in the well (1/2-1 tbsp depending on the size of the dough), pinch the dough to seal the paste inside. Roll it into a ball shape or a longer log like I did. If the azuki bean paste is too soft, you can scoop them using a melon baller and freeze for half hour until they harden slightly. Dip the stuffed dough in a bowl of white sesame. Repeat the same process for the rest. If you’re not frying and serving this immediately, refrigerate them in an airtight container so the dough doesn’t dry out. You can also freeze these for up to a week or so, no need to thaw, just add a couple more minutes to the frying time. Fry in ~325-350F oil until golden. Depending on the size, about 3-6 minutes, making sure the dough is cooked through. Place the fried mochi balls on some paper towel to drain excess oil. **If you like the dessert to be sweeter, dust the freshly fried mochi balls with powdered sugar. **Glutinous rice flour and azuki paste can be found in any Asian grocery market, or sometimes in the ethnic foods aisle in major supermarkets. Thx for the recipe. I have 2 bags of pumpkin purée and no idea what to do with it. Would it be possible to bake the mochi instead of frying? Looking forward to the gnocchi post! I think if you want to bake it, you might need to add eggs/oil or some other ingredients to make it work. This recipe came from an ancient Chinese cookbook from my mom and it gave very few and vague instructions so I did quite a bit of research online. One of the recipes I came across had very similar procedure and ingredients, yet the mochis are steamed. Definitely much healthier and no doubt equally tasty! Pingback: Pumpkin Ricotta Gnocchi [recipe] | Cin Cin, Let's Eat! 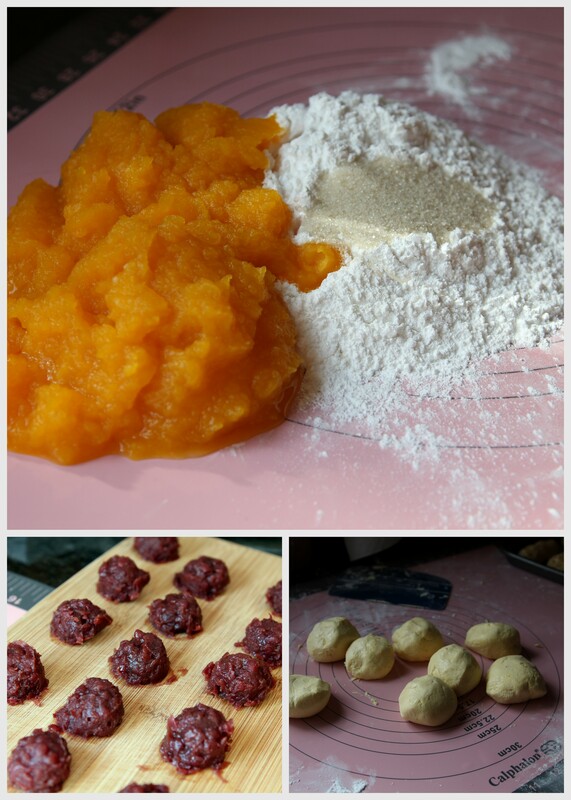 Pingback: Making Daifuku Mochi [recipe] « Cin Cin, Let's Eat!